This page is part of the ISAMA online Directory of the Arts, Mathematics and Architecture. Please send suggestions to the webmaster. Or email the author, Ivars Peterson. Ivars Peterson, mathematics writer for Science News, and author of books including "The Jungles of Randomness", has a new book on mathematics and art. 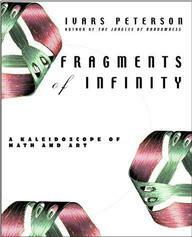 Fragments of Infinity: A Kaleidoscope of Math and Art was published in September 2001 by John Wiley. Peterson has arranged with ISAMA to have an (updated and expanded) online bibliography for the book here. You can purchase Fragments of Infinity directly from the ISAMA webpage, in association with Amazon.com.